of what the swing is intending to accomplish. during the backswing and “hole” during the follow-thru. my performance, so my thinking mind is satisfied that the saying will carry the intellectual content of my intention throughout the performance. out of the way of the intention to perform the action. captures your attention for the duration of the swing. process can be while being coached by Fred Shoemaker (author of Extraordinary Golf ). 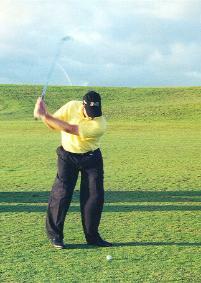 forward swing action that would perform a draw. If I heard “fade” I was suppose to react with a forward swing action that would perform a fade. and many others became a part of the arsenal. his whole torso is turning to face the target. His lower back is still flat at this point, and the rotation has carry his extension up and around to this point. 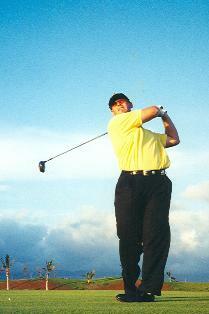 This is representative of a very good rotary style or body style of golf swing. 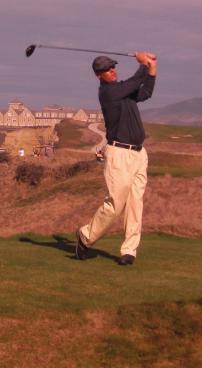 EA Tischler at (408)203-7599, or email your questions to EA Tischler at newhorizonsgolfer@yahoo.com.